If you view a computer as an input-processing-output machine, you can use a keyboard or removable storage device as the input, a program as the processing, but what can you use to retrieve the output? One way to acquire the output, be it text or graphics, is with a video display. Before we go into the details of how the microprocessor gets involved with the video display, lets learn exactly how a video display works. We'll start by describing a monochrome display. If you were to examine the display with a magnifying glass, you would see that it is covered with dots. 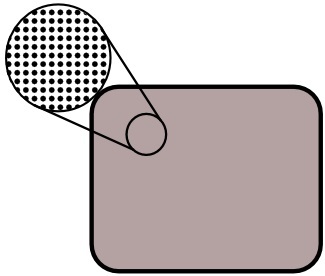 These dots are called pixels, short for "picture elements". The picture above shows how, by turning on certain pixels, and turning off other pixels, the letter "E" can be created on the display. Early displays were a matrix 640 pixels wide and 480 pixels high. A matrix of pixels can be made using LEDs (Light Emitting Diodes). 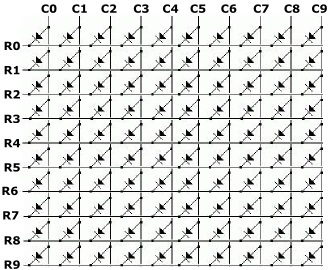 A schematic for a matrix of LEDs is shown above. If ground is applied to a specific row and a positive voltage is applied to a specific column, the LED at the intersection of that row and column would light up. Using this method multiple LEDs can be turned on Simultaneously, thus creating a desired letter or graphic shape. 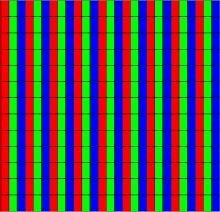 If you were to examine a modern OLED (Organic LED) display with a magnifying glass, you would see that it is covered with red, green, and blue rectangles. An organic LED is similar to a regular LED, except the material that emits light in response to an electric current is an electroluminescent organic compound rather than a semiconductor crystal.